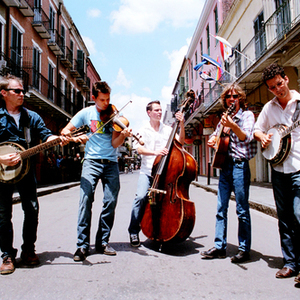 Old Crow Medicine Show is a folk/country group from Nashville, Tennessee. Along with original songs, the band performs many pre-World War II blues and folk songs. The style of music they perform is sometimes called alt-country, but today more often referred to as Americana. Their 2004 album "O.C.M.S." was selected by CMT (Country Music Television) as one of the top-10 bluegrass albums of that year. Their current tour includes bars, festivals, and larger venues. Their 2004 album "O.C.M.S." was selected by CMT (Country Music Television) as one of the top-10 bluegrass albums of that year. Their current tour includes bars, festivals, and larger venues. They are best experienced in smaller settings, where their infectious high-energy style electrifies the crowd, often a mixture of older listeners and 20-somethings. They make frequent guest appearances on A Prairie Home Companion. The song Wagon Wheel is written based off a chorus composed by Bob Dylan for the film Pat Garrett and Billy the Kid.